How To Make Money Online With Swagbucks: I Made $1,020! 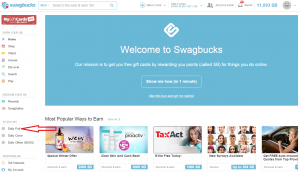 It’s official, Swagbucks is one of the easiest way to make extra money online. To date, they have paid out more than $122,000,000 – and I’m out to get my piece of that pie! If you’re new to Swagbucks, or just want to amp up the amount you’re earnings with them, then this tutorial is for you! I’ve gathered the 18 best ways to make extra money with Swagbucks no matter how much time and energy you have. Swagbucks was one of the first ways that I started making money online. Back before I started a blog, even before I graduated college, I was using Swagbucks to bolster our Christmas budget, splurge occasionally, and even buy groceries when money was REALLY tight. I even used Swagbucks to furnish our daughter’s nursery, buy her clothes, and defray the costs of expensive breast pump and maternity clothes costs. To date, I’ve earned more than $8,000 from Swagbucks – and who couldn’t use an easy extra $8,000?? If you want to sign up for Swagbucks, head HERE. When you sign up through my link, Swagbucks will give you a 300SB bonus to get you started. Then, read through the tips below (or watch the video) above learn about how to use and make money with Swagbucks! Each day, Swagbucks polls it’s members on different topics: anything from their favorite food, how they listen to music, and more! The daily poll only pays 1 SB, but considering it takes about 2 seconds of your time – and that SB goes towards your daily goal + bonus (I’ll explain how that works in a minute) – it’s well worth your time. To find the Daily Poll, from your Swagbucks dashboard, look to the toolbar on the left. About halfway through the toolbar you’ll see a section called “TO DO LIST.” Click on the Daily Poll to answer that day’s question! Daily Offers (NOSO) are located right beneath the Daily Crave. NOSO stand for “No Obligation Special Offers” – which basically means that you’re going to be presented with a bunch of “money-saving offers” that you should feel free to skip. You don’t have to sign up for ANY of them in order to earn Swagbucks with NOSO. Just find the “skip” button under each offer, and when you get to the end you’ll be rewarded with 2 SB. It literally takes less than 30 seconds and contributes towards your daily goal + bonus. 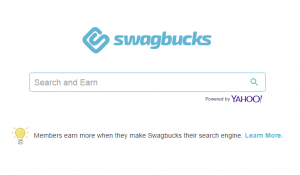 Use Swagbucks for ALL of your internet searches. Using Swagbucks instead of Google results in the same set of search results + you are rewarded for searching. I even search for sites I already have bookmarked because it’s a chance to win big Swagbucks! Special Offers & Free Trials through Swagbucks are plentiful and range from signing up for subscriptions services and credit cards, to completing surveys, and even completing free offers. Find Special Offers by click “Discover” on the left hand side toolbar. Then, once you’re in Discover, choose “Free Offers” on the left to find activities that reward you without costing you any money. Of course, while you’re free to only complete free offers, you can also shop through these Special Offers and earn some big Swagbuck bonuses! When you see a SwagCode, enter it in the SwagButton to have the Swagbucks entered immediately into your account! After you install the SwagButton, it will notify you when there is a new code so you don’t have to constantly be on the hunt for them! The Swagbucks Inbox can be found by clicking “Inbox” at the top right hand corner in your Swagbucks Dashboard. It contains Special Offers, SwagCodes, and limited-time bonuses that you should take advantage of when you have time. Each day, Swagbucks sets a goal for you to reach in Swagbucks earned. Even better, it sets Reward Tiers. Once you hit the first goal (as seen above) you’ll be given a second, larger goal. You can see your progress when you hover your mouse pointer over the daily goal up at the top of your Swagbucks Dashboard. When you have time, Swagbucks TV can allow you to earn up to 150 Swagbucks per day. Simply open up Swagbucks TV from your Dashboard or SwagButton, and watch television in a new window while you work on other tasks. For every 10 videos you watch, you’ll be prompted to enter a code, and be awarded 3 SB, up to 150 per day. It’s really not a big deal to “watch” Swagbucks TV while working on your computer. Need to unwind from work a bit? 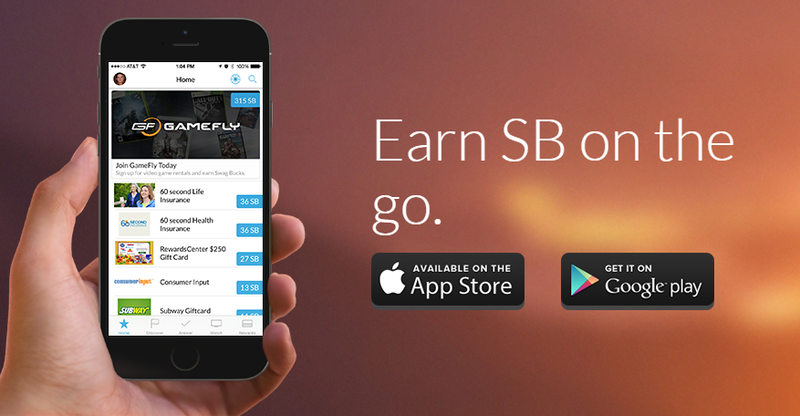 Earn Swagbucks while you waste the day away with 2 SB earned per 2 games, up to 10 per day. That may seem like a lot of effort, but you don’t actually have to finish each game to earn the Swagbucks. Just play for a few minutes, then click the ‘Back To Games” Button to earn your Swagbucks. To find the free games, scroll down to the bottom of the games section to find the free Swagbucks Games like Swag Memory, Swag Jump, Swagasaurus Run. Swagbucks is committed to making earning easy (remember the $122 Million they’ve already given to members??) so they have a really slick mobile app that gives you extra ways to earn on the go. The app is available for both Android and iOS devices, is free, and allows you to earn an extra 50 SB per day just for watching videos while you’re out and about. My favorite way to use the mobile app is to run videos in the background while I work on other things. Frequently Swagbucks releases exclusive SB codes on their social media channels, especially Facebook and Twitter. They also have an Instagram which you can follow, but they release codes there less periodically. If you have the time, and are earning Swagbucks for a big goal (Say, $125 Sam’s Club Gift Card) taking surveys when you have a spare moment is a great way to boost your earnings. Earnings vary by survey, but I find it is very easy to take the daily survey for 60 SB + any other surveys you qualify for. Find the Surveys Section by clicking “Answers” on the left hand side of your Swagbucks Dashboard. Behind referring friends (more on that in a minute) printing and redeeming coupons at grocery stores and pharmacies are the biggest and baddest way I earn Swagbucks. You don’t have to be an extreme couponer to use this section, just print coupons for items you were going to buy anyway, and then earn 10 SB for each one you redeem at the grocery store. What an awesome way to get rewarded for saving money! Do a lot of online shopping? Then you’ll love this! Swagbucks has a Shop & Earn section that gives you cash back (in the form of Swagbucks) for shopping all the sites you love, by click from Swagbucks first. The feature works much like eBates, except that your percentage rewards are credited in the form of Swagbucks. To make earning even easier, if you install the Swagbucks Button, you’ll automatically be notified if you could earn SB from a site you’re shopping on. With one click of a button you’ll be on your way to scoring Swagbucks back from your purchase! Did you know that Swagbucks has their own credit card? It makes sense, when you consider the shop & earn feature. The offer isn’t great, but if you transfer a balance within the first 3 billing cycles, you’ll earn a 1,000 SB credit, and when you spend $1,000 in the first 6 months, you’ll earn an additional 2,500 SB. The APR is 0% for the first six billing cycles, on both purchases and balance transfer. After that the APR varies from 11.99% to 18.99%, based on creditworthiness. Finally, we’ve reached the most efficient way to earn Swagbucks; by referring your friends. Facebook, Pinterest, Twitter, and even Isntagram is a great place to share your Swagbucks referral code. When you do and a friend signs up, you’ll both receive at least a 100SB bonus + youw ill earn 10% of their Swagbuck earnings for LIFE. There is no limit to this, and besides sharing the link, it requires almost no effort on your part. I share my referral code on social media and this website, which over time has netted me thousands of dollars in Swagbucks, simply by talking about things I love, helping families save and make money, and make their homes happy! After you’ve accumulated Swagbucks through your favorites of the methods above, you can redeem them in one of two ways: redeeming them for gift cards, or shopping in the Swagbucks store. Once a month, you can redeem Swagbucks at a discounted price, 2,200 points for a $25 gift card. Utilizing this discount every month is a great way to stretch your Swagbucks. You will be required to Verify your identity, either by answering a security question or verifying by email. Then all you do is wait for the email that says your gift card has posted! It may take up to 10 days for gift cards to show up in your account, but once they do you can use them instantly! Think You Can’t Earn $100’s or $1,000’s Of Dollars From Swagbucks Each Year? You can – and you don’t have to have blog to do it! Redeemable for at least $1,105 in gift cards (even if you don’t take advantage of the once a month $25 gift card discount). If you take advantage of the discount, those same Swagbucks are good for $1,140 in gift cards, or about $100 extra at the grocery store or in your pocket every month, or Christmas for your family, or even a vacation! And all without referring a single friend! To get started earning an extra $1,000 this year with Swagbucks, sign up here! Do you use Swagbucks? How much have you earned? Share your brags with us in the comments!